Russia's Afrikantov OKBM has completed the assembly of the second KLT-40S reactor for the country's first floating nuclear power plant, currently under construction in St Petersburg. The first reactor has already been delivered. The assembly and acceptance testing of the reactor was conducted at the Nizhniy Novgorod AtomEnergoProekt (NN-AEP). OKBM Afrikantov designed and provided technical support for the manufacture of the reactor, while Izhorskiye Zavody produced the reactor vessel and NN-AEP manufactured parts for the reactor and assembled it. An acceptance committee has confirmed that reactor is to the required standard. The committee comprised representatives from NN-AEP, Afrikantov OKBM, from Energoatom's Directorate for the Construction of Floating Nuclear Power Plants, the Russian Maritime Register of Shipping and the Federal Service for Ecological, Technological and Nuclear Supervision (Rostekhnadzor). Assembly of the first reactor for the floating plant was completed earlier this year and the reactor vessel for the unit was shipped to the Baltiysky Zavod shipbuilding company in St Petersburg on 31 May for fitment to the completed keel of the first floating plant, the Akademik Lomonosov. The pressure vessel for the second reactor was shipped on 5 August The reactor internals are scheduled to be shipped to the company in mid-August. The Akademik Lomonosov will house two 35 MW KLT-40S nuclear reactors, similar to those used in Russia's nuclear powered ice breakers, and its generators will be capable of supplying a city of 200,000 people, officials said. OKBM has designed and supplied the reactors, while Kaluga Turbine Plant will supply the turbo-generators. The power vessel was originally destined for the Archangelsk industrial shipyard, which is near to Severodvinsk in northwestern Russia, but will now be deployed at Vilyuchinsk, in the Kamchatka region in Russia's far east. 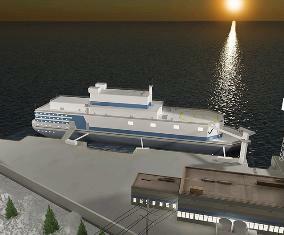 Baltiysky Zavod is to complete the floating plant in 2011. It should then be ready for transportation by the second quarter of 2012 and is set to be handed over to Energoatom by the end of 2012. Rosatom is planning to construct seven further floating nuclear power plants in addition to the one now under construction, with several remote areas under consideration for their deployment. Gazprom is expected to use a number of the floating units in order to exploit oil and gas fields near the Kola and Yamal Peninsulars.